The High Plains Initiative is near the end of its 15-month effort to promote dialogue on growth and planning in Platte and Goshen counties. Launched in March 2010, the High Plains Initiative is a pilot project for Building the Wyoming We Want (BW3), a statewide non-profit planning organization. Over the past year the High Plains Initiative (HPI) has fostered a lot of civil discussion about the future of this region. It has also drawn sharp criticism from about two-dozen individuals in a loosely organized, but vocal, opposition group. In the process, a citizen drew an imaginary public path along a river. Another participant protested that the desired route crossed private property, saying the land in question belonged to a family member who was not present at the meeting. In a small community where property owners know one another, drawing a line over private land without input from the owner is seen as highly presumptuous, and it struck a nerve. “It was intended to be a conceptual exercise. But in real Wyoming where real people own property on a map, people take offense to that,” said Dan Kirkbride, a BW3 board member and past Platte County commissioner. From that seed of mistrust grew a concerted effort to locate the origins of HPI and discern whether it threatens private property rights. HPI materials claim its process is meant to help residents identify what they value about their communities. By seeing various growth projections, residents can better articulate what they want their counties to look like in the future. But members of the property-rights group view the efforts as a non-local, top-down regulatory assault on their rights. They claim it follows ideology created by the United Nations and the U.S. Environmental Protection Agency. Is HPI not the grassroots planning effort that former Gov. Dave Freudenthal and BW3 said it was? Grappling with that question did not bring about consensus in Platte and Goshen counties. But leaders say it did generate passionate local conversation and engagement necessary to such efforts. At the March 15 meeting of the Platte County Commission, critics made a presentation regarding HPI’s relation to property rights, and called for the commission to halt HPI immediately. The principal speakers were Cheri Steinmetz, an unsuccessful 2010 state senate candidate, and Paul Miner, chairman of the Platte County Republicans. Platte County commissioner Terry Stevenson said the county took no action on the request to stop HPI, on the premise that HPI had the right to public assembly and free speech given to any group. At the same time, Stevenson stressed that the conclusions of HPI would result in no special legal authority over the planning process, which has always remained firmly in the hands of elected officials and their appointees. In a March 26 article published in the Wyoming Livestock Roundup Steinmetz expressed her view that BW3 and HPI are conceptually related to the United Nations Agenda 21 and the EPA’s Smart Growth program. A document by an anonymous Goshen County resident explains the connections on WyomingWatchdogs.com. Steinmetz, who lives in Goshen County, continues to write about HPI on her political website. Individuals also brought their criticisms to the April 25-28 meetings of HPI, where citizens were asked to provide input on a variety of growth scenarios created in response to their input in 2010. Kirkbride said the total number of participants at the April meetings dropped to 125 residents, compared to the 300 who showed up for the October mapping workshops. The opposition group may have scared away participants from last fall who were looking forward to thinking about the region’s future, said Anja Bendel, BW3 steering committee member and director of the economic development district for Platte, Goshen, Laramie and Albany counties. Platte County Cbommissioner Terry Stevenson said the opposition group spoke at length at the recent meetings, and many who had participated in the October HPI meetings got up and left as the evening wore on into the night. Despite the perceived flagging of enthusiasm for the effort, the High Plains Initiative steering committee still gathered plenty of information. 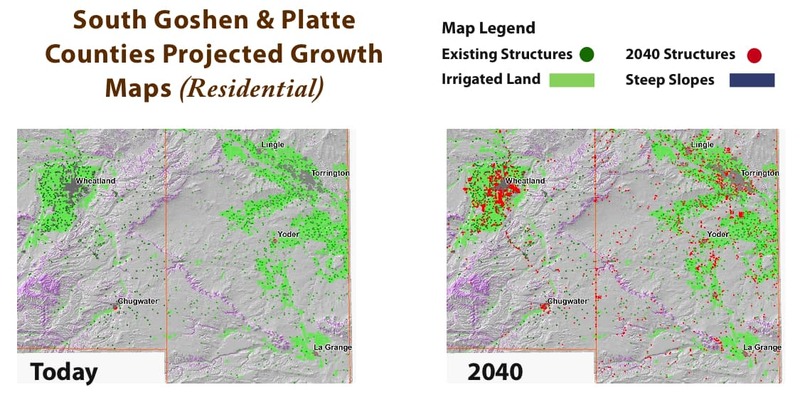 They have a wide variety of perspectives to consider as they put the finishing touches on a 50-plus-page document that summarizes how Platte and Goshen County residents hope growth will occur in the region. The committee is aiming to complete the document by late June. Stevenson and Goshen County commissioner Ross Newman say the document will contain a general set of observations about attitudes toward growth, rather than a clear set of policy recommendations for county commissioners to consider. Instead of making recommendations for where growth should occur, the HPI document will describe desired outcomes in a more general format, according to Kirkbride. It will also include the perspective of residents who opposed HPI, said Bendel. Stevenson said he’s confident the document will gain the approval of those opposed to HPI. “My attitude is when they see the product that the High Plains Initiative comes out with that they are not going to have any problem with it. I think they will be pleasantly surprised,” said Stevenson. Newman had a similar conclusion. Steinmetz, Cullen and others say they have concerns about HPI’s origins because it receives technical support from non-local organizations. Steinmetz and Cullen also researched Heart + Mind Strategies, the polling company that phoned more than 200 Platte and Goshen County residents last June. When contacted by WyoFile, Steinmetz declined to give an interview. But she did offer a written summary of her criticisms of HPI and its polling methods. “I am one of many citizens in Goshen and Platte Counties who do not support BW3 or HPI. We oppose the publication of any vision document as produced by survey of less than 300 residents out of the approximately 22,000 residents of both counties,” Steinmetz wrote. Cullen questioned the motives of the polling company. “We don’t need any involvement from Heart and Mind (Strategies). Basically, they are an advertising company. They are experts on strategies to convince people of things, whether to buy a product or accept an idea. I don’t like their philosophies,” she said. 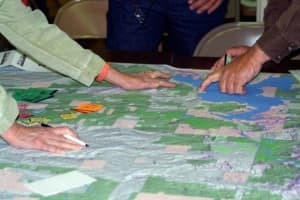 Some private property advocates say that Smart Growth and Agenda 21 use collaborative decision-making as a veiled method of creating consensus on the reduction of property rights. Steinmetz said she and others oppose programs based on such an agenda. 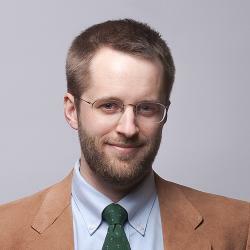 “We believe in individual rights as guaranteed by our Constitution rather than collective rights, group consensus, and government restrictions on the use of private property for the perceived common good,” Steinmetz wrote. Some who oppose Smart Growth say land planning limits the ways a landowner can use their property, thereby doing harm to the capitalist system. There are instances in which Smart Growth proponents favor mixed-use developments that do exactly what Cullen advocates: provide property-owners greater freedom from zoning regulations so that businesses can be placed next to homes. An example was discussed in this recent Casper Star Tribune article. While HPI may have conceptual similarities to other land use planning models used across the nation, and the world, its direct origin came in response to the Building the Wyoming We Want conferences of 2008 and 2009. At those events, former Gov. Dave Freudenthal called for local communities to begin conversations about growth before they are overrun by it. He was inspired by the experiences of Colorado and Utah, where growth turned rural areas into urban zones before communities had time to effectively plan. In part, the BW3 effort advised citizens to engage in guiding growth in such a way that their local governments could live with less tax revenue without straining services. In the same release, U.S. Sen. John Barrasso (R-Wyoming) endorsed BW3’s call for Wyoming to start guiding its growth. “If we don’t make these choices ourselves, Washington will force one of its ‘one size fits all’ solutions on us,” Barrasso stated. After the June 2009 BW3 conference, Ross Newman said the Platte and Goshen County economic development groups independently applied to serve as a pilot project for the BW3 planning model. BW3 asked them to work together on the project because their region shared so many similarities. 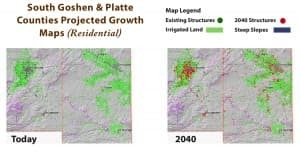 Platte and Goshen County commissioners directed their support, and contributed several thousand dollars of county funds to the effort, hoping to gather input that would reveal a vision for these low-growth counties where the population has remained stagnant for more than 20 years. The effort seemed well timed as the counties saw increased wind development and the potential for large amount of growth through the Niobrara oil exploration play. HPI embraced a planning model inspired by the work of Envision Utah, a planning non-profit that rallied 10 counties along the Wasatch Front to create a regional plan to preserve the small community atmosphere residents said they valued. Envision Utah used GIS and 3-D visioning software to illustrate possible outcomes of different planning scenarios. Envision Utah’s work was highlighted at the first BW3 conference. Members of the HPI steering committee say that the process and the opposition has taught them a lot about planning in their communities. “We reached the conclusion that that was overreaching; to include in the document a map that showed the walking path (which set off the initial controversy),” said Newman. Letting such developments occur through the normal planning processes is a basic sign of respect of private property, he added. “To draw a line (on private property) that says this is a walking path, that’s not appropriate. I’d be the first one to concede that,” Newman said. After the initial controversy about the mapping exercise, HPI adapted its maps so that they no longer showed detailed close-ups where individual property parcels could be identified. The new maps show general trends. 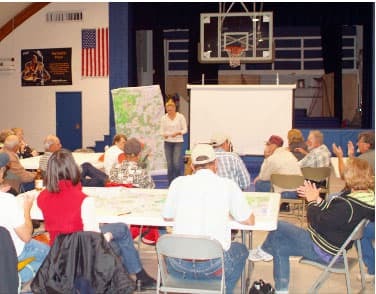 In addition to allowing HPI to respond to public feedback, the process provided a forum for discussing new planning concepts to local citizens. Examples include how sprawl effects taxes and services, and about growth strategies such as cluster subdivisions and infill development. “I’m not sure that we got to discuss those as much as we wanted. I think the opposition sidetracked us,” said Kirkbride. A major aspect of HPI was trying to dispel myths and fears. For example, the steering committee tried to clarify that HPI is in no way a policy-making entity: “Anything that comes out of the HPI document has no authority,” Newman said. “The only way to implement any part of that is through the normal statutory process that the Goshen County commissioners would have to use in terms of land use issues. That’s public hearing and the whole nine yards. Any time you are under state statute, there is a very public process,” Newman said. Stevenson puts his faith in the public involvement and transparency of HPI. “Even if it were as nefarious as some people think it is, the members of HPI are discerning enough to keep it from actually being that way,” he said. HPI committee members said they also learned about the persistence of misinformation, particularly the belief that HPI could entangle the county in the federal governing process. Kirkbride said that simply isn’t true. “It was much more benign and innocent document than (the property rights group) thought it was, but we haven’t convinced them of that,” Kirkbride said. In the end, that may not matter since HPI did not set out to convince the public to accept a preconceived planning agenda, but instead to gather public opinion. “We had more than 300 people participate in this process. … We were simply asking for public input and we took the public input that came,” Newman said. While Newman has been an active member of the HPI steering committee, he said he has been careful to not to guide it to a specific outcome. The steering committee is co-chaired by two local citizens: Julie Kilty and Cindy Witt. “In my commentary on these drafts I’ve deferred to the other members because this is a document that ultimately is intended to influence political leaders such as myself. Being engaged in the process is one thing, driving the process is altogether different,” Newman said. Newman and Kirkbride agreed that Platte and Goshen County’s experience with HPI will not necessarily be the same for other communities that choose to work with the BW3 process. Kirkbride said when HPI releases its final document to public he expects to hear more comments and critiques. But that’s part of the process. Newman judges the effort a success even though 300 HPI participants are not a large number compared to the over 20,000 residents of the counties. 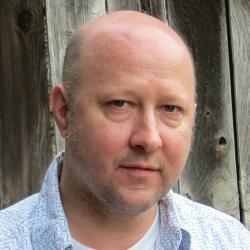 Greg Nickerson is a writer, historian and filmmaker from Big Horn. Contact him at 307-752-6031 or gregory.m.nickerson@gmail.com. The High Plains Initiative [HPI] recently released its final document, making it available on the Building the Wyoming We Want website: http://www.buildingwyoming.org. The document’s release concludes a 16-month regional planning process in Platte and Goshen counties. HPI’s final document is 48 pages long. It contains six chapters: Introduction, Public Process, Values, Population and Land Use Trends, Alternative Growth Scenarios, and Conclusions. On page three, HPI committee members expressed their hope that the document would be useful in helping elected officials maintain safe and friendly communities without resorting to intrusive regulations or diminishing property rights. Growth in Platte and Goshen counties has been static for decades. The authors of the document make a case that planning is needed in light of the region’s potential growth from wind and oil development. Planning is also important if a boom does not come: “Even if our counties continue to experience flat or declining population, our communities still face hard decisions on how to pay for aging infrastructure with a limited revenue stream,” according to the document. (Page 3). On page 15 the HPI Executive Committee acknowledged that the public strongly valued property rights, low taxes, and minimal regulation: “Although these values were not identified in the initial [summer 2010] survey, the HPI Steering Committee addressed these concerns in their discussions and they are noted in this report.” (Page 8). A listing of the financial supporters of BW3 and HPI, and a list of Platte and Goshen County residents who served on the steering committee can be found on pages 44-47. Building the Wyoming We Want or Keeping the Wyoming We Have? The very name, Building the Wyoming We Want implies that we do not HAVE the Wyoming we want and suggests we are unable to “build” it on our own. I disagree. We cherish our family, friends, freedom, and our independent rural way of life. BW3 was started by Governor Freudenthal under the guise of “protecting” the things we hold dear. Last time I checked, we were perfectly able to do that on our own. It is the overreaching regulation and spending of government that threatens the American way of life. Here in Goshen County BW3 is called the High Plains Initiative or HPI. HPI/BW3 is a threat to freedom and an assault on our individual rights, especially regarding private property and the ability to choose how we use our land. The document, which has already been created for Goshen and Platte Counties, invites SMART Growth, Sustainable Development and United Nations Agenda 21 into our county by creating a false statement of public support for these principles. Sustainability invokes government power to enforce activists’ views of environmentalism. It seeks to replace farmers’, ranchers’ and other landowners’ concept of stewardship with government-centric control. It merges environmentalism and socialism by government control of land use, food production, housing, transportation, manufacturing, energy rationing and even health care. As a member of the HPI Steering Committee I witnessed firsthand that this is a marketing ploy called the Delphi technique, designed to manipulate the public and bring them to a predetermined “consensus.” It is not a “grass roots” process; rather it has been driven from the top down using the local HPI steering committee as a formality and our good reputations as a front to give credibility to an illegitimate non-profit organization and their undemocratic process. 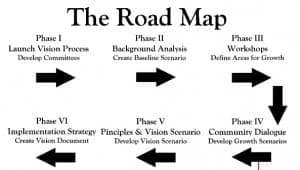 This is a cookie cutter model that is being used by SMART Growth catalysts, such as Envision Utah, nationwide. This is not our plan, it never has been! If you are in agreement, contact your elected officials and “Just say NO” to BW3’s hidden agenda. Tell them we want BW3 STOPPED, defunded and removed from our Counties and State without a trace left to haunt us. BW3 asked, so let’s tell them We are Keeping the Wyoming We Have! To learn about SMART Growth, Sustainable Development, UN Agenda 21; http://www.epa.gov/smartgrowth/, http://www.un.org/esa/dsd/agenda21/, http://www.freedom21.org , http://www.democratsagainstagenda21.com Wyoming information http://www.wyomingwatchdogs.com.